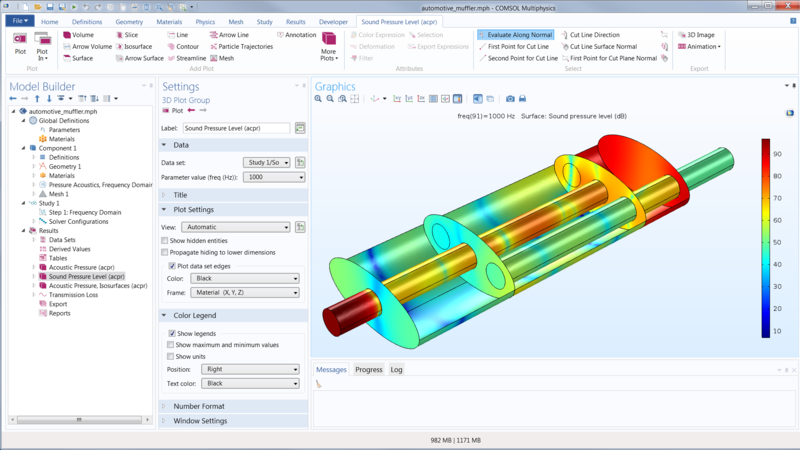 Engineers and scientists use the COMSOL Multiphysics® software to simulate designs, devices, and processes in all fields of engineering, manufacturing, and scientific research. 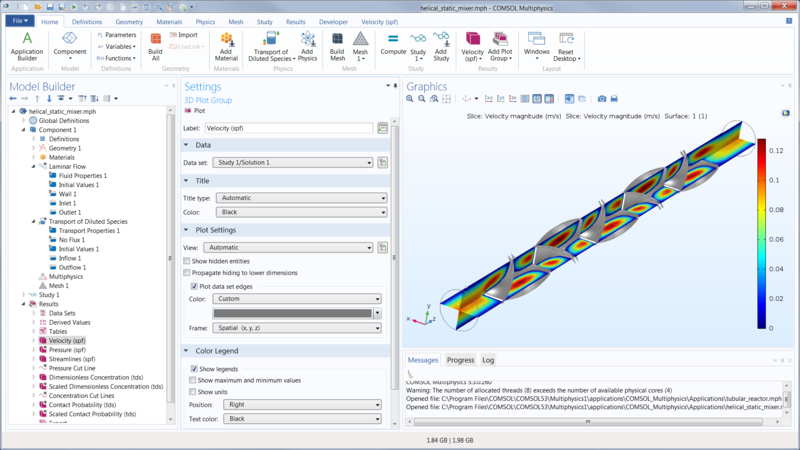 COMSOL Multiphysics® is a simulation platform that encompasses all of the steps in the modeling workflow — from defining geometries, material properties, and the physics that describe specific phenomena to solving and postprocessing models for producing accurate and trustworthy results. To create models for use in specialized application areas or engineering fields, you can augment COMSOL Multiphysics® with any combination of add-on modules from the product suite. The interfacing products make it possible to also integrate simulation with other engineering and mathematical software used in product and process design. When you have developed a model, you can even convert it into a simulation application with a dedicated user interface, which can be designed for a very specific use by people beyond the R&D department. Structural mechanics example: performing a static linear analysis of a bracket. Fluid flow example: modeling the mixing process and the pressure difference through a helical static mixer. Electromagnetics example: computing the 3D electrostatic field in an einzel lens. Chemical engineering example: studying the reacting flow in a plate reactor. Acoustics example: analyzing the pressure wave propagation in a muffler for a combustion engine. Heat transfer example: modeling the anisotropic properties of a carbon-fiber-reinforced polymer. Multiphysics example: coupling electric current conduction, heat transfer and sources, and structural stresses and strains due to thermal expansion in order to model a two-hot-arm thermal actuator made of polysilicon. Equation-based modeling example: using the Korteweg-de Vries (KdV) equation to model waves in optical fibers. Often, the key to successful engineering simulations is developing experimentally validated models that replace the use of experiments and prototypes alone, and give a deeper understanding of the studied design or process. Compared to running experimental methods or testing prototypes, modeling allows for quicker and often more efficient and accurate optimization of processes and devices. As a user of COMSOL Multiphysics®, you are free from the restrictive nature generally associated with simulation software and have complete control over all aspects of your model. You can also be creative in a way that is impossible or a lot harder with traditional approaches, thanks to the ability to couple any number of physics phenomena together and input user-defined physics descriptions, with associated equations and expressions, directly in the graphical user interface (GUI). Accurate multiphysics models consider a wide range of possible operating conditions and physical effects. This makes it possible to use models for understanding, designing, and optimizing processes and devices for realistic operating conditions. Modeling with COMSOL Multiphysics® means being able to move between simulating electromagnetics, structural mechanics, acoustics, fluid flow, heat transfer, and chemical reactions phenomena, or any other physics modeled by a system of PDEs, in one software environment. You can also combine physics phenomena from these areas in a single model. 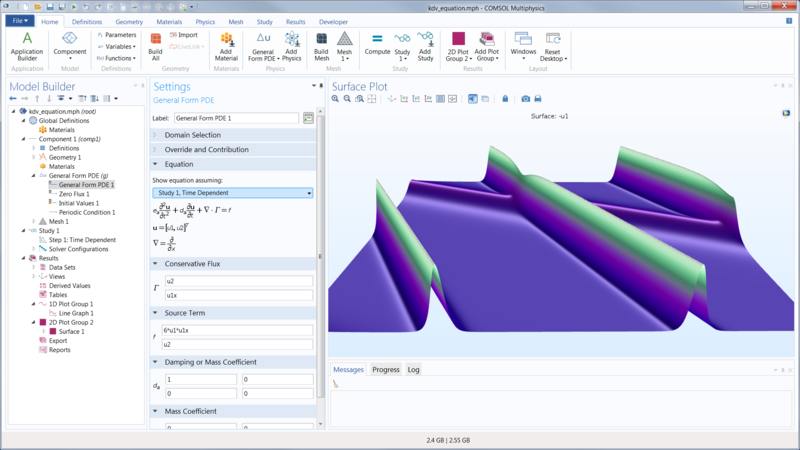 The COMSOL Desktop® user interface provides you with a complete simulation environment and a consistent modeling workflow from start to finish, regardless of the type of design or process you wish to analyze and develop. 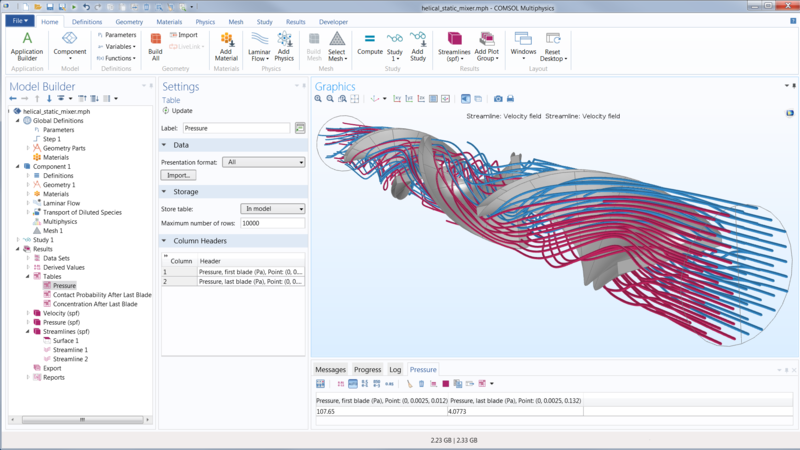 The core COMSOL Multiphysics® package provides geometry modeling tools for creating parts using solid objects, surfaces, curves, and Boolean operations. 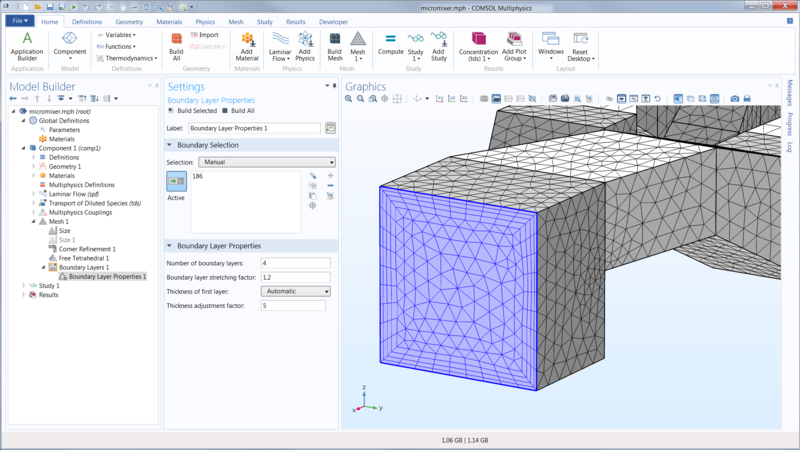 Geometries are defined by sequences of operations, where each operation is able to receive input parameters for easy edits and parametric studies in multiphysics models. The connection between the geometry definition and defined physics settings is fully associative — a change in the geometry will automatically propagate related changes throughout the associated model settings. Geometric entities such as material domains and surfaces can be grouped into selections for subsequent use in physics definitions, meshing, and plotting. Additionally, a sequence of operations can be used to create a parametric geometry part, including its selections, which can then be stored in a Part Library for reuse in multiple models. 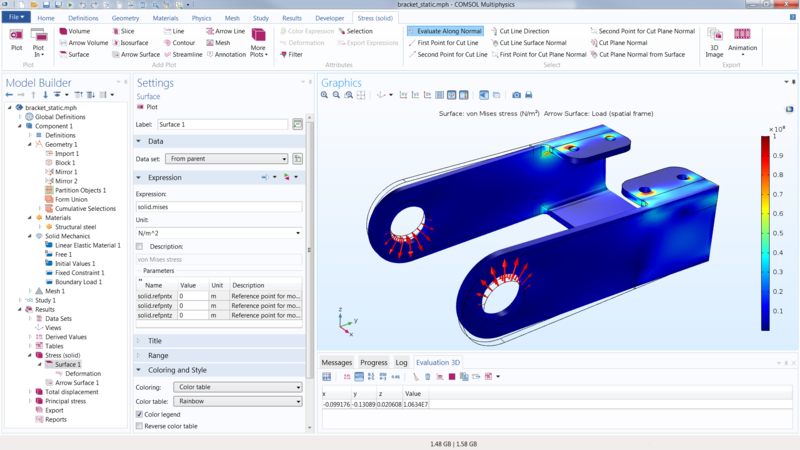 The import of all standard CAD and ECAD files into COMSOL Multiphysics® is supported by the CAD Import Module and ECAD Import Module, respectively. The Design Module further extends the available geometry operations in COMSOL Multiphysics®. Both the CAD Import Module and the Design Module provide the ability to repair and defeature geometries. Surface mesh models, such as in the STL format, can also be imported and then converted to a geometry object by the COMSOL Multiphysics® core package. Import operations are like any other operation in the geometry sequence and can be used with selections and associativity for performing parametric and optimization studies. As an alternative to the defeature and repair capabilities of the COMSOL® software, so-called virtual operations are also supported to eliminate the impact of artifacts on the mesh, such as sliver and small faces, which do not add to the accuracy of the simulation. In converse to defeaturing, virtual operations do not change the curvature or fidelity of the geometry, while yielding a cleaner mesh. 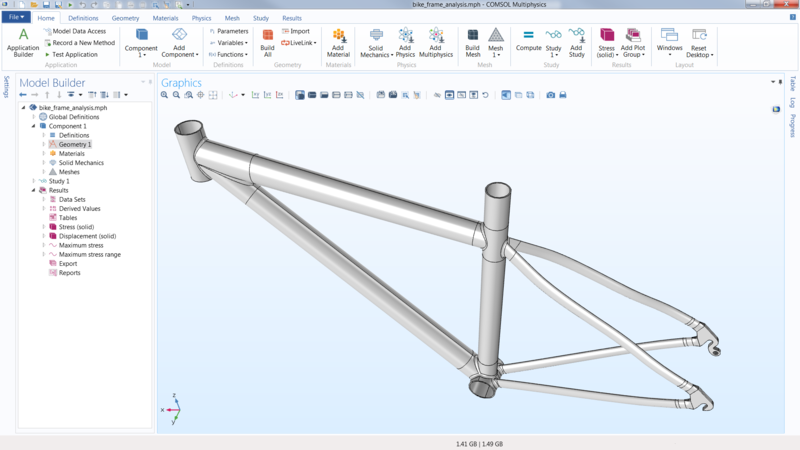 A bike frame has been designed using the SOLIDWORKS® software and is ready for import into COMSOL Multiphysics®. Geometries can also be imported from other CAD software or created using the COMSOL Multiphysics® geometry tools. The bike frame geometry is repaired and manipulated using tools in COMSOL Multiphysics®. The geometry could alternatively be created from scratch in COMSOL Multiphysics®. 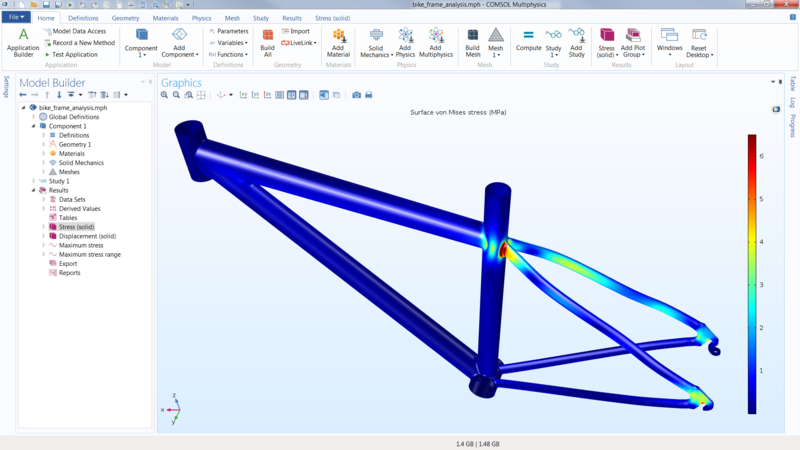 The bike frame geometry has been meshed in COMSOL Multiphysics® and is ready for simulation analysis. 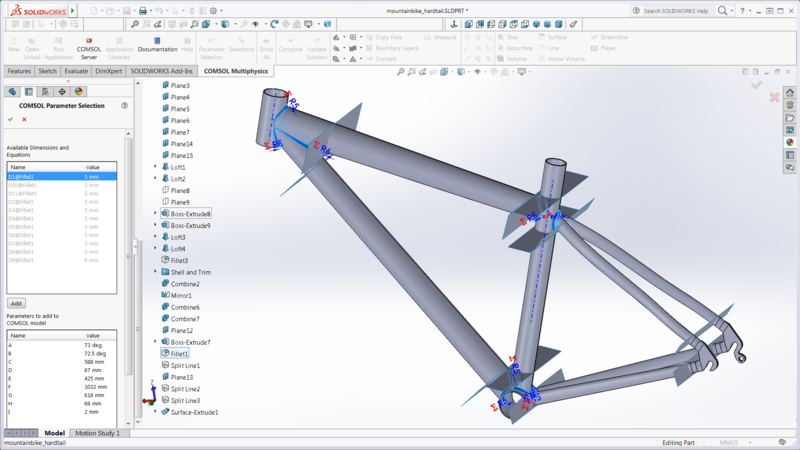 The bike frame model has been solved in COMSOL Multiphysics® and the results can be analyzed, prompting design changes in the CAD software for further analysis. 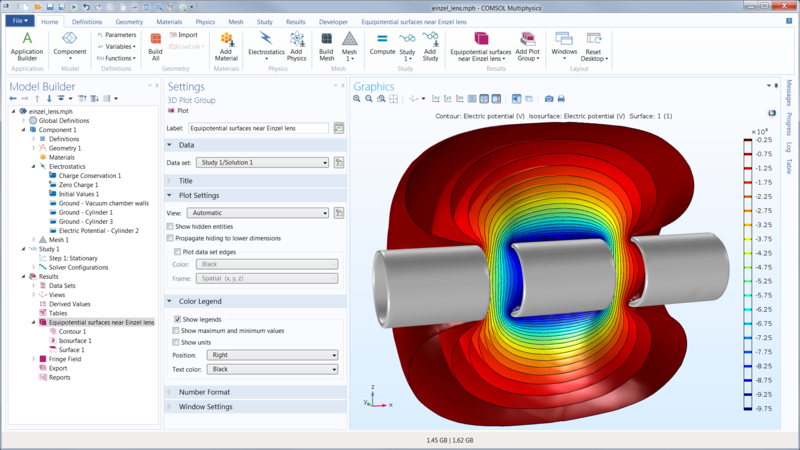 The COMSOL® software contains predefined physics interfaces for modeling a wide range of physics phenomena, including many common multiphysics couplings. The physics interfaces are dedicated user interfaces for a particular scientific or engineering field, where all aspects for modeling the phenomena in question are made available for manipulation — from defining the model parameters to discretization to analyzing the results of the solution. Upon selecting a particular physics interface, the software suggests available study types, such as time-dependent or stationary solvers. The software also automatically recommends the appropriate numerical discretization of the mathematical model, solver sequence, and visualization and postprocessing settings that are specific to the physics phenomena. The physics interfaces can also be combined freely in order to describe processes that involve multiple physics phenomena. The COMSOL Multiphysics® platform is preloaded with a large set of core physics interfaces for fields such as solid mechanics, acoustics, fluid flow, heat transfer, chemical species transport, and electromagnetics. 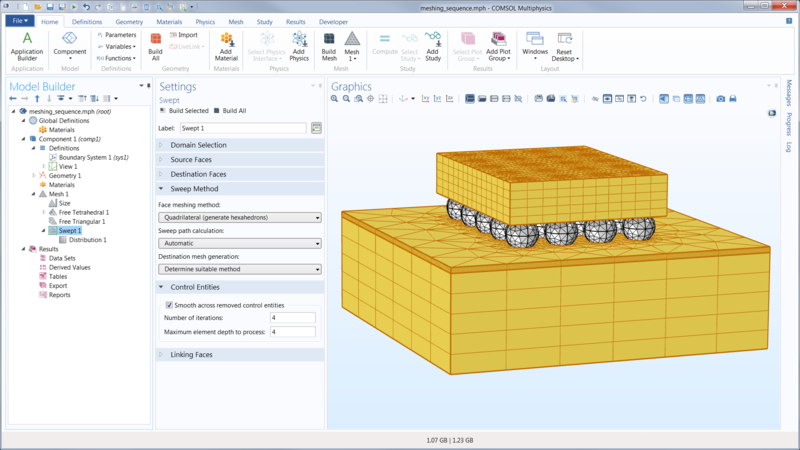 By expanding the core package with add-on modules from the COMSOL® product suite, you unlock a range of more specialized user interfaces that expand modeling capabilities within specific engineering fields. A thermal actuator is modeled with COMSOL Multiphysics®. The Heat Transfer branch is expanded to show all of its associated physics interfaces. In the example, all add-on products have been installed, resulting in many available physics interfaces. To really be useful for scientific and engineering studies and innovation, a software has to allow for more than just a hardwired environment. It should be possible to provide and customize your own model definitions based on mathematical equations directly in the user interface. 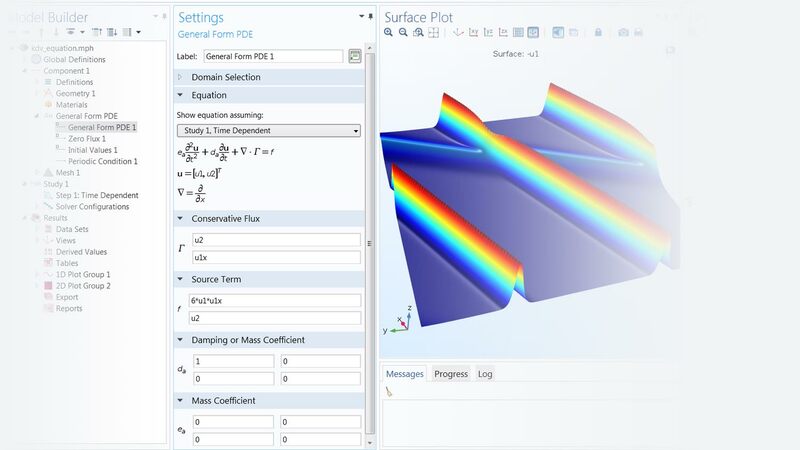 The COMSOL Multiphysics® software offers this level of flexibility with its built-in equation interpreter that can interpret expressions, equations, and other mathematical descriptions on the fly before it generates the numerical model. Adding and customizing expressions in the physics interfaces allows for freely coupling them with each other to simulate multiphysics phenomena. The capabilities for customization go even further. With the Physics Builder, you can also use your own equations to create new physics interfaces for easy access and manipulation when you want to include them in future models or share them with colleagues. Waves in optical fiber have been modeled using the KdV equation. Partial differential equations (PDEs) and ordinary differential equations (ODEs) can be entered into COMSOL Multiphysics® using coefficient matching and mathematical expressions. For discretizing and meshing your model, the COMSOL Multiphysics® software uses different numerical techniques depending on the type of physics, or the combination of physics, that you are studying. The predominant discretization methods are finite-element based (for a complete list of methods, see the solvers section of this page). Accordingly, the general-purpose meshing algorithm creates a mesh with appropriate element types to match the associated numerical methods. For example, the default algorithm may use free tetrahedral meshing or a combination of tetrahedral and boundary-layer meshing, with a combination of element types, in order to provide faster and more accurate results. 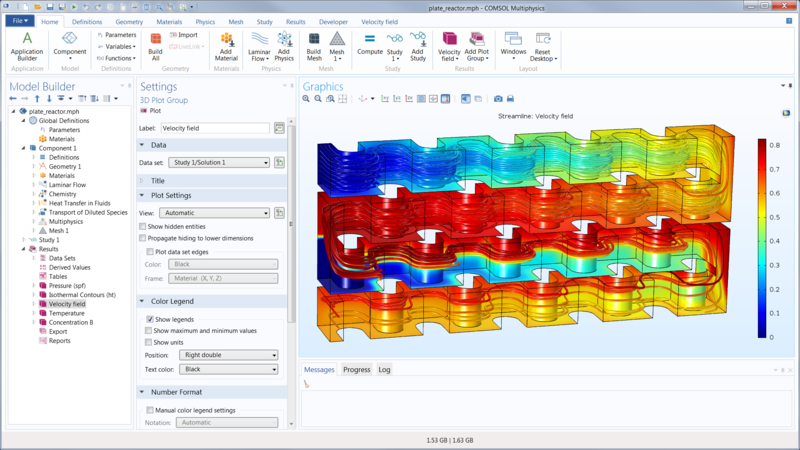 For all of the mesh types, mesh refinement, remeshing, or adaptive meshing can be performed during the solution process or study step sequence. 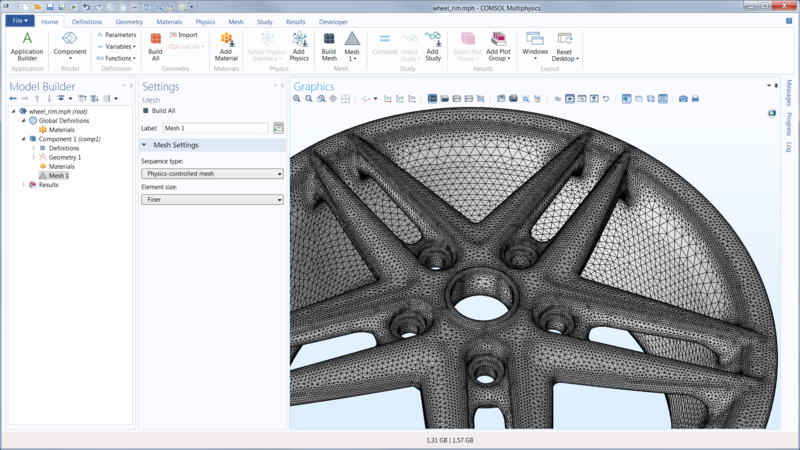 A wheel rim model geometry has been meshed with an automated unstructured mesh. A micromixer model geometry has been meshed with a semiautomated mesh containing boundary layers. The geometry of a model depicting part of a circuit board with a chip mounted via solder ball joints has been meshed using a manual mesh sequence combining tetrahedral, triangular, and swept meshes. 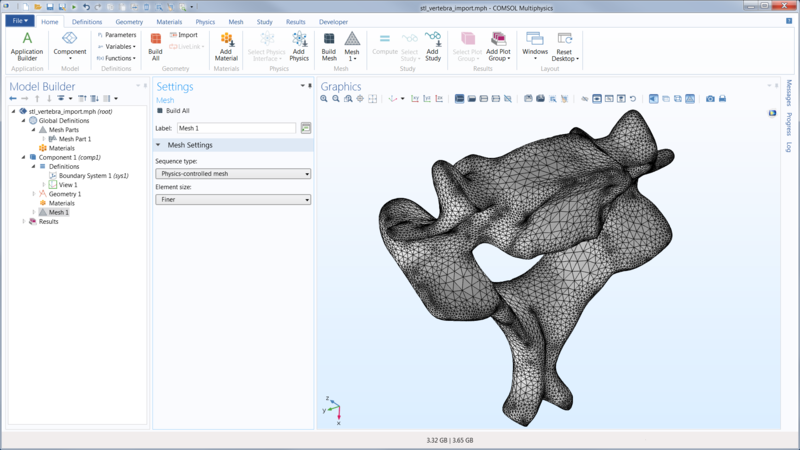 The surface mesh of a vertebra model has been saved in the STL file format and then imported into COMSOL Multiphysics®, where it has been converted to a geometry and meshed with an automated unstructured mesh. STL geometry courtesy of Mark Yeoman, Continuum Blue, U.K. When you select a physics interface, a number of different studies (analysis types) are suggested by COMSOL Multiphysics®. For example, for solid mechanics analyses, the software suggests time-dependent, stationary, or eigenfrequency studies; for CFD problems, the software would only suggest time-dependent and stationary studies. Other study types can also be freely selected for any analysis that you perform. Study step sequences structure the solution process to allow you to select the model variables for which you want to solve in each study step. The solution from any of the previous study steps can be used as input to a subsequent study step. Any study step can be run with a parametric sweep, which can include one or multiple parameters in a model, from geometry parameters to settings in the physics definitions. Sweeps can also be performed using different materials and their defined properties, as well as over lists of defined functions. Optimization studies, using the Optimization Module, can be performed for topology optimization, shape optimization, or parameter estimations based on a multiphysics model. 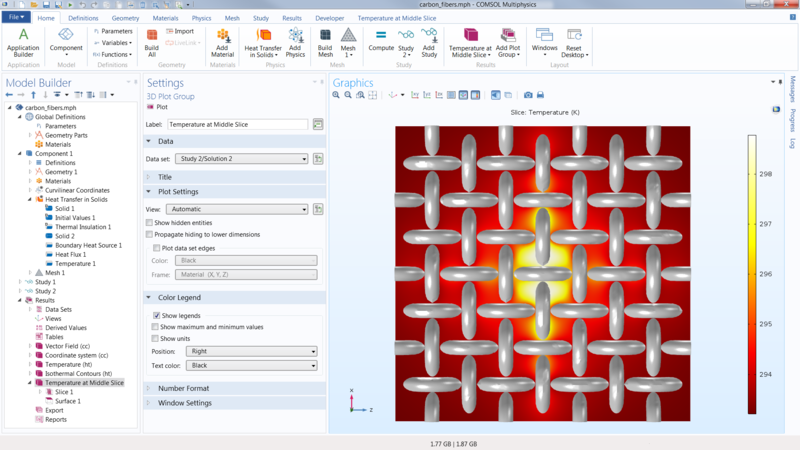 COMSOL Multiphysics® offers both gradient-free and gradient-based methods for optimization. For parameter estimation, least-squares formulations and general optimization problem formulations are available. Built-in sensitivity studies are also available, where they compute the sensitivity of an objective function with respect to any parameter in the model. A model has been parameterized. In COMSOL Multiphysics®, models can be made parametric with algebraic relationships between parameters and variables. Parameters can represent geometric dimensions as well as physical properties. The equation interpreter in the COMSOL Multiphysics® software delivers the best possible fuel to the numerical engine: the fully coupled system of PDEs for stationary (steady), time-dependent, frequency-domain, and eigenfrequency studies. The system of PDEs is discretized using the finite element method (FEM) for the space variables (x, y, z). For some types of problems, the boundary element method (BEM) can also be used to discretize space. For space- and time-dependent problems, the method of lines is used, where space is discretized with FEM (or BEM), thus forming a system of ordinary differential equations (ODEs). These ODEs are then solved using advanced methods, including implicit and explicit methods for time stepping. Time-dependent and stationary (steady) problems can be nonlinear, also forming nonlinear equation systems after discretization. The engine in COMSOL Multiphysics® delivers the fully coupled Jacobian matrix, which is the compass that points the nonlinear solver to the solution. A damped Newton method is used for solving the nonlinear system for stationary problems or during time stepping for time-dependent problems. The Newton method then solves a sequence of linear equation systems, using the Jacobian matrix, in order to find the solution to the nonlinear system. 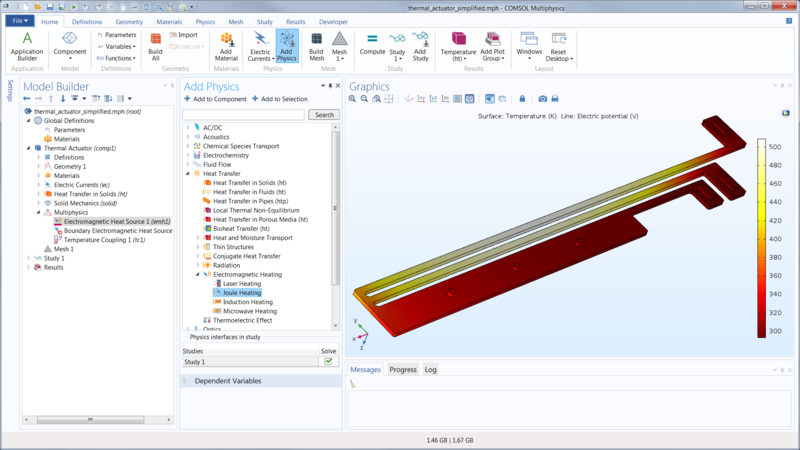 For linear problems (also solved in the steps of the nonlinear solver, see above), the COMSOL® software provides direct and iterative solvers. The direct solvers can be used for small- and midrange-sized problems, while the iterative solvers can be used for larger linear systems. The COMSOL® software provides a number of iterative solvers with cutting-edge preconditioners, such as multigrid preconditioners. These preconditioners provide robustness and speed in the iterative solution process. The different physics interfaces can also provide the solver settings with suggestions on the best possible default settings for a family of problems. These settings are not hardwired; you can change and manually configure the solver settings directly under each solver node in the user interface to tune the performance for your specific problem. When available, the solvers and other computationally intense algorithms are fully parallelized to make use of multicore and cluster computing. Both shared and distributed memory methods are available for direct and iterative solvers as well as for large parametric sweeps. All steps of the solution process can make use of parallel computing. Show off your results to the world. COMSOL Multiphysics® sports powerful visualization and postprocessing tools so that you can present your results in a meaningful and polished manner. You can use the built-in tools or expand your visualizations with derived physical quantities by entering mathematical expressions into the software. Therefore, you can visualize just about any quantity of interest related to your simulation results in COMSOL Multiphysics®. Visualization capabilities include surface, slice, isosurface, cut plane, arrow, and streamline plots, to name just a few plot types. A range of numerical postprocessing tools are available for evaluation of expressions, such as integrals and derivatives. You can compute the max, min, average, and integrated values of any quantity or derived quantities throughout volumes, on surfaces, along curved edges, and at points. Postprocessing tools specific to certain areas of engineering and science have also been included in many of the physics-based modules. You can export data and process it via third-party tools. Numerical results can be exported to text files on the .txt, .dat, and .csv formats as well as to the unstructured VTK format. With LiveLink™ for Excel®, results can be exported to the Microsoft® Excel® spreadsheet software file format (.xlsx). Images can be exported to several common image formats, as well as the glTF™ file format for exporting 3D scenes. Animations can be exported in the WebM format and as animated GIF, Adobe® Flash® technology, or AVI files. Reports summarizing the entire simulation project can be exported to HTML (.htm, .html) or Microsoft® Word® software format (.doc). The sound pressure level in an automotive muffler has been visualized in a surface plot (top) and the transmission loss as a function of frequency has been plotted in a 1D graph (bottom). In many organizations, a small group of numerical simulation experts is servicing a much larger group of people working in product development, production, or as students studying physics phenomena and processes. To make it possible for this small group to service the much larger group, the COMSOL Multiphysics® software contains functionality for building simulation applications. 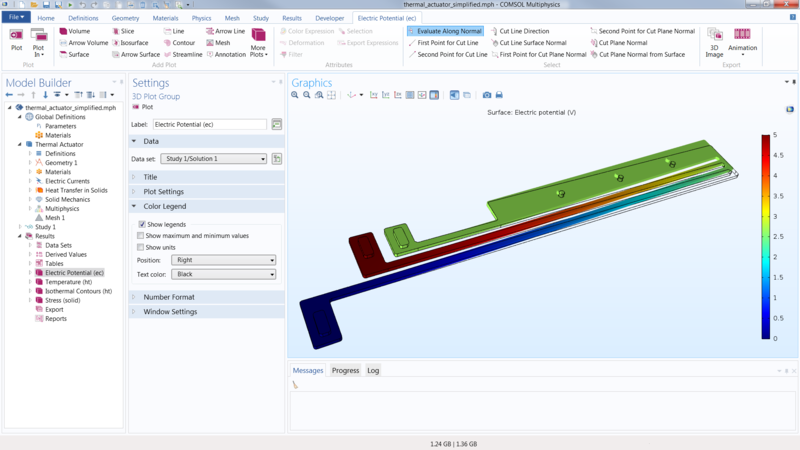 The Application Builder allows simulation experts to create intuitive and very specific user interfaces for their otherwise general computer models — ready-to-use custom applications. The general model can serve as a starting point for several different applications, each with its own restricted input and output options relevant for a specific task. Applications can include user documentation, checks for “inputs within bounds”, and predefined reports at the click of a button. For intermittent usage, applications can be run through COMSOL Multiphysics®. For regular usage, applications can be deployed with the addition of the COMSOL Server™ or COMSOL Compiler™ products. Both products allow you to share your finished applications with your design teams, manufacturing departments, process operators, test laboratories, customers, and clients worldwide. COMSOL Server™ is an application management tool with which you can safely and securely deploy applications, either through your internal network or across the web. 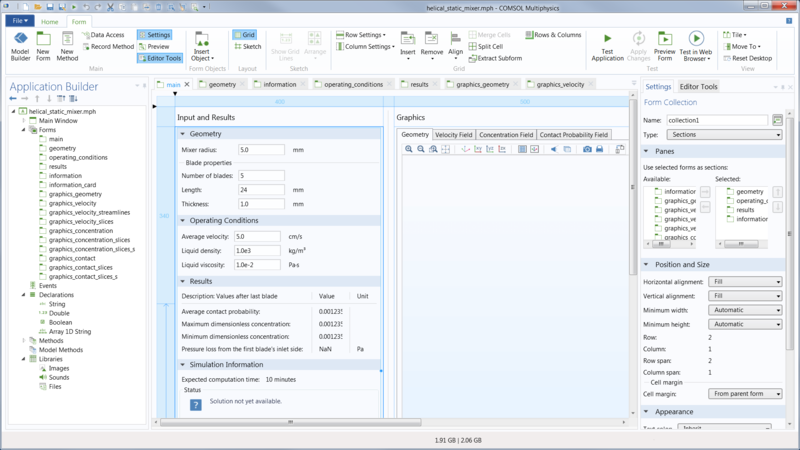 COMSOL Compiler™ is an add-on to COMSOL Multiphysics® that enables you to create standalone applications, which can be run on a desktop or laptop computer without COMSOL Multiphysics® or COMSOL Server™. A helical static mixer model has been created using the Model Builder in the COMSOL Multiphysics® software. 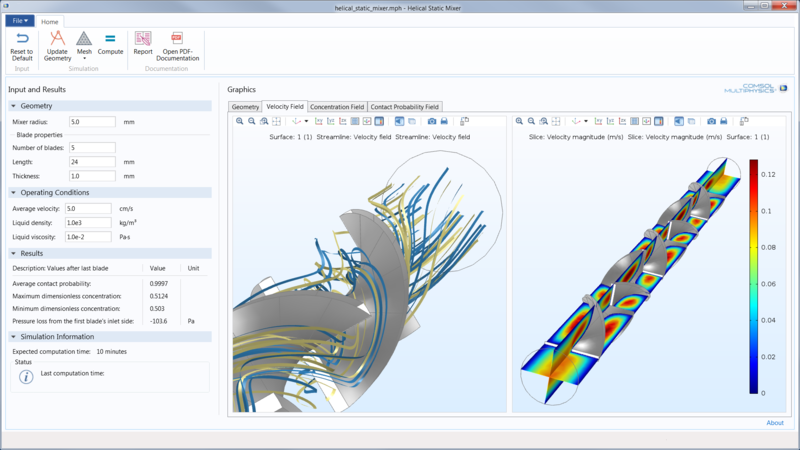 The helical static mixer model is being turned into a simulation app using the Application Builder in COMSOL Multiphysics®. The helical static mixer app is ready for use. Even those who lack simulation expertise can analyze the system's mixing efficiency by easily varying the number and dimensions of the blades and the monomers' liquid properties and inlet velocity.